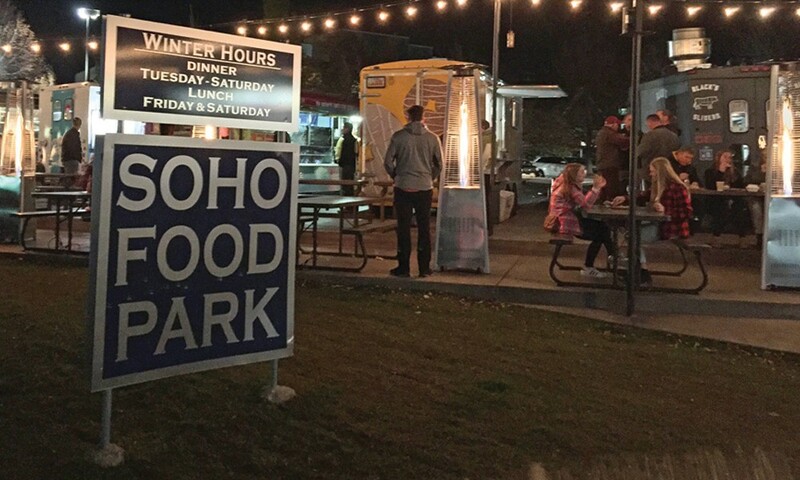 In its third season, Soho Food Park sets a high bar for food-truck excellence. My first food-truck roundup devolved into one of the most miserable nights of my life. The small parking lot became a vast tangle of people as the lines at each truck chaotically meshed into one another. A variety of food was available—but each queue was so enormous that I had to commit to visiting just one truck. For the 90 minutes I spent enduring the blacktop-amplified summer heat and inhaling generator exhaust while waiting for a burger, I couldn't help but feel like a chump. Here I was, waiting 1½ hours for a dish that I could have gotten two blocks away—inside a building with air conditioning, no less—because it was coming to me from a grill on wheels. While this experience was enough to turn me off of the whole food-truck roundup craze, it wasn't long after that I discovered the Soho Food Park (4747 Holladay Blvd., facebook.com/sohofoodpark). The brainchild of Holladay residents Shelly and Mark Olson, the park is the blessed antithesis of the garden-variety food truck roundup. The Olsons provide a spacious location, picnic tables, power and, perhaps the most important aspect, they curate each truck. "We try to be the filter so you don't pick a bad truck when you come to the park," Mark says. "We make sure the trucks are all clean and fresh, and it's something that we continually work on." During Soho's three years, the Olsons have become experts in identifying a good truck. If a vehicle has been invited to join the park roster, it's been evaluated and approved by some industry insiders. "We have enough core trucks, so we're much more selective about who [can] fit in to our rotation," Shelly says. "We need a truck that cares a lot," Mark adds. "You've got to have a truck operator with some soul and passion for what they're doing." This year's lineup brings back some regulars, along with a few new additions. World's Best Corn Dogs is joining the roster, commuting all the way from Kaysville to bring park attendees, well, the planet's best corn dogs. Park City's Freshies Lobster Co. will be slinging Maine lobster rolls. Suzy Thai and Fiore Pizza will also be on hand to serve up some delicious curry and wood-fired pizza, respectively. "We want people to come here and not have to pick just one kind of food for dinner," Shelly says. "We have six spots, and we need to make sure they're uniquely different." The park is ideal for those who have been burned by a lackluster food-truck roundup, but still dig the idea of sampling a wide variety of mobile cuisine. The park is open from Thursday to Saturday, 5 p.m.-8:30 p.m. Check out their Facebook page for a full, tasty lineup. Conservation efforts in northwest quadrant are mighty, but are development plans stronger?